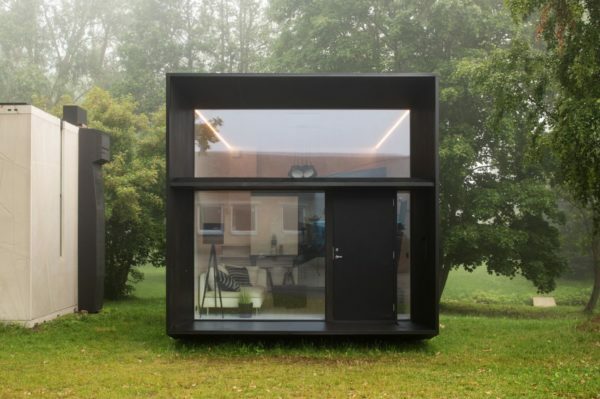 This is the KODA Light Portable Mini House by KODASEMA. It’s a 269 sq. ft. home designed in Estonia. The idea is that it can be assembled in a day and is portable. So whenever you move, you can take your home with you. KODA tackles premium affordability by fitting into the cracks of the system in unused urban spaces. Elegant mini KODA houses create a prime quality mixture of homes, hotels, offices, shops, cafes, studios and service shops, and a community area in a snap. Meanwhile use unlocks the best sites. KODA Light, constructed on timber frame using wood, glass, steel, is an energy-efficient movable house. Installation takes less than a day. Making the most of space, a small and comfortable apartment has functionally been fitted on 25 m2. The modular houses can be connected to create bigger areas, mini villages and entire lifestyle or office communities. Temporary plots, given aesthetical and design value, are rapidly incorporated into urban space and community. The flexibility of multifunctional modular KODA villages enables instant relocation. Temporary permits and meanwhile planning allow for meaningful use of transitory or vacant plots and land in the city centrals. Your house(s) will be delivered all-in-one via trailer in one piece. We will take care of the logistics. The site preparation is minimal. All a KODA needs is ground with levelled footing (assuming you want a level floor), access with a crane, and connection points for water, sewage, and electricity. Lifting and shifting shall be done by Kodasema or an authorised partner. One day for installation – pack the toothbrush and move in. KODA is designed to be relocated and repurposed infinite times. A single lorry to carry it in one piece and a crane to nest it in, KODA will move with you where ever your ideas, career and life take you. No need for a foundation, no finishing works after the delivery. Turn key in a day. Want to try out KODA? Try KODA STAY if you’re ever in Tallinn, Estonia. Learn more at KODA. You can also follow KODA on Facebook. This is what I’ve been talking about for a while, a TH delivered by trailer or flat bed wrecker. There is no reason for a permanent trailer, it’s costs or being limited to 8′ wide, a terribly limiting width. 10′ wide though gives you so many more options and can use standard furniture. Not fond of the loft as just makes it unnecessarily tall, more costly. Just use the materials and make the whole thing longer. I do like the flat roof for a porch. I’d put up solar high enough to sit under for shade. The other great thing is designing them modular so one can grow as needed. One way to get by on permits is do a modular design large enough but only build the first part. Or in my case, I live, sleep on a couch bed in my 10×16′ studio, has everything I need without being cramped. Pretty amazing concept. Very geometric design. Very pretty house on the inside. . .outside is a little “boxy”. Haha! I like it! I like it, uncluttered and cube design. The extended version has everything you need. Wondering about price tag. Well done. Nice but anyway is pungent like “giant cactus”, (and it’s not insignificant ). Do they deliver overseas, especially inside Europe and how much?This could solve a lot of problems for us and be better than a mobile home which we currently share. Great idea. What an interesting and modern design! I would like to see a different color scheme. Some of the angled black areas create a sense of space not there and confuses me. In the kitchen it appears a stairway is angled near the corner where the drawer cabinet is. Another area a triangle of black next to a closet or shelf area creates the illusion of another stair or something hiding in the wall. Being portable and quick to set up is nice. Do not plan on moving this very often due to time spent on preparation and packing plus moving the contents separately.